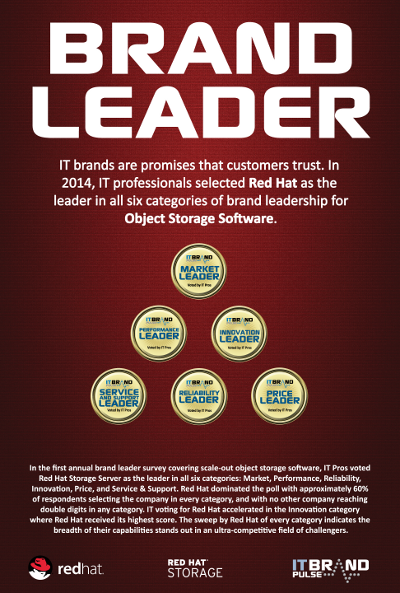 We are pleased to announce that Red Hat Storage received the 2014 Brand Leader award for object storage software by IT Brand Pulse. 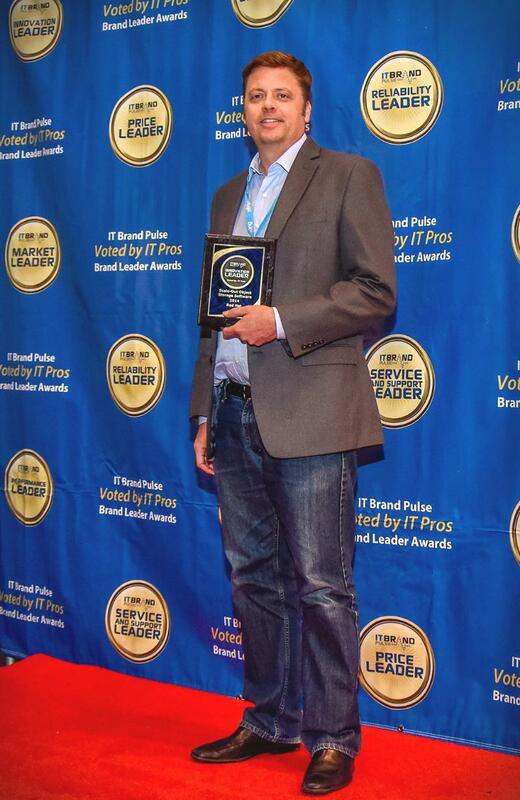 The winners of the annual award are selected by IT professionals in an independent, non-vendor-sponsored survey conducted in October 2014 with IT Brand Pulse’s 1,000,000+ members of 100+ online IT groups. Survey respondents were asked the vendors they perceived as the leader in six categories for scale-out object storage software: market, price, performance, reliability, service and support, and innovation. Unlike proprietary, hardware-based storage, the Red Hat Storage portfolio of products gives an open, software-defined storage platform that scales across physical, virtual, and cloud resources. It provides the tools for users to significantly cut costs, prevent vendor lock-in, and add infinite capacity without degrading performance. Pictured below receiving the award is Scott Clinton, senior director of product marketing, Storage, Red Hat. For more information about the award results and winners, visit IT Brand Pulse 2014 Leaders. For more information about Red Hat Storage and open software-defined storage, visit http://www.redhat.com/en/technologies/storage.